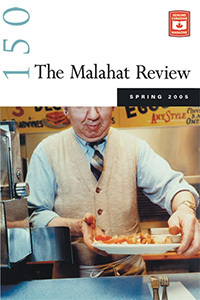 On the cover of this issue a gentleman in a light-blue collared shirt, his knitted sweater vest tucked neatly into his apron, serves up a plate of food across a restaurant counter, his movement captured by photographer Frank Pimentel’s camera. The title of the photograph, ”Jack Serving Special, 1987,” reveals that what Jack is about to place before us is not your average dish—and what is contained between the covers of the 150th Malahat Review is special, indeed. This issue begins with fiction by Patricia Robertson, whose work has appeared in Best Canadian Stories and Best Canadian Essays. Robertson presents a captivating storyline accompanied by a healthy portion of the fantastical in “The Goldfish Dancer,” an account of a woman and her stage persona who performs to enthusiastic club-goers from a large aquarium complete with a flurry of glittering goldfish. Giller-nominated, award-winning Bill Gaston, whose memoir, Just Let Me Look at You, is forthcoming from Hamish Hamilton, takes us on a camping trip. “Mothers don’t go camping with relatively new boyfriends and ask the sixteen-year-old son along.” But in “The Night Window” that's exactly what Tyler’s mother does. Other fiction includes Andrew J. Wilson’s “Good Morning, Mr. President,” an uncanny account of an aging and increasingly unhinged dictator (sound familiar? ), as told by his butler, and “The Janitor,” a short story by Oscar Martens about a newly-hired high school janitor who allows himself to be mistaken as the newly-hired principal. Lorna Crozier, recipient of the Order of Canada among many other honours and awards, contributes three poems to this issue. In “Rapture,” she imagines the son of god and the choice he must make upon his return to earth—where to go first? Sina Queyras’ free verse washes over us in “The Waves, An Unmaking,” as she explores recurring themes from Virginia Woolf’s The Waves. These poems were later included in her book, Lemon Hound, which was recognized with the Pat Lowther Award and a Lambda Literary Award. Other poetry highlights include: “A Fine Story,” by Philip Kevin Paul; “She Goes Running,” by Ken Victor; “Women’s Work, After VE Day,” by Anita Lahey; and “After Helping My Daughter With Her Math Homework,” by Marica L. Hurlow. Also of note, an appreciative review of Alice Munro’s Runaway, by the late Mike Matthews, and one of Margaret Atwood’s collection of essays, Moving Target, by Kitty Hoffman. This issue, like a delicious, well-balanced meal, will leave those with an appetite for a variety of literary styles very satisfied.